Get insider tips on how to create an outstanding entry-level resume as a current student or recent graduate. 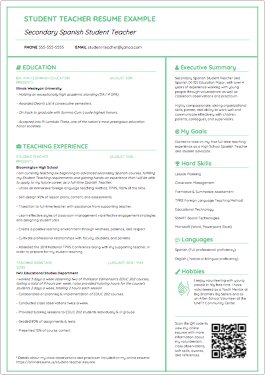 Creating the ideal application is never easy, especially if it is your first time drafting a resume. No matter whether you are writing an entry-level resume as a current student or recent college graduate, there are certain elements that apply differently to you than a seasoned professional. That’s why we have crafted this beginner resume writing guide, in order to give you all the important information when it comes to composing your first resume: resume purpose, how to get started, sections to include, special tips for current students and new grads, as well as example resumes. Use the following guide to help you compose your best possible resume and land your first interview! Before getting started, it is important to first remember the purpose of your resume. Although it seems obvious, the objective of your resume is to advertise yourself and your abilities in such a way that catches the eye of the hiring manager, and for them to want to get to know you better in an interview. This means you need to select the most relevant facts about your academic history, achievements, and skills and present them in a way that shows off your strengths and unique ability to fulfill the specific job position at hand. Remember the purpose of a resume is to convince the employer that you are worth interviewing, in order to meet the person behind the resume. The idea is to show the employer that you are the best possible candidate to get the job done. Don’t forget that everybody has a resume, so the only way to make sure that you will receive a callback is to make your resume stand out from the crowd, capture the attention of the person in charge of the hiring process and clearly demonstrate why you deserve the opportunity to interview with them. Now that you recall that the objective of your resume is to sell yourself, you can begin the brainstorming step of creating your resume. First, it is best to read the job post or listing that you are planning to apply for. Focus especially on the necessary education, experience, and knowledge or skills listed on the job posting. Take note of the specific qualifications and requirements needed to fulfill the job position. These are the qualities that the hiring manager will be looking for in an applicant. You must incorporate the minimum requirements in order to be considered a serious candidate. Keep in mind that whatever information you include on your resume, you must be able to explain in an interview. Now that you know what the hiring manager will be looking for in a candidate, take some time to write down all of your qualifications and requirements that directly relate to the job posting. Jot down all of your relevant past experiences, including work related positions, volunteerism, educational experiences, extracurricular activities and leadership roles, internships or practicum, and any honors or awards that you have received. Look back once again at the job listing and match all of your relevant experience with the job requirements and prefered attributes. Highlight all of the information on your brainstorming list that directly relates to the job that you are applying to.Yes, that means that you should create a different resume for each application, especially if it is not the same job role or career field. By using a generalized resume for all of your applications, you are not only missing the opportunity to differentiate yourself from other applicants, but it also makes it more difficult for recruiters to see your job-specific potential. On the other hand, if you tailor your resume to each job role that you are applying for, hiring managers will more easily be able to identify your capabilities and experience that directly align with the job at hand. Therefore, you will be more likely to land an in-person interview, as recruiters will want to get to know the candidate behind the application. When creating a resume as a current student or recent graduate, there are certain sections that you should emphasize more than if you were a professional with an extensive work history. In most cases, you will not have as much work experience within your desired career field. Thus if this is true for you, it is not beneficial to accentuate your work experience section. Instead, it is best to highlight your relevant academic experience, applicable internships, transferable skills, awards and honors, as well as your extracurricular activities that align with the job position or career industry that you are applying to. In the following paragraphs, we break down each individual resume section and how to amplify it specifically as a student or new grad. Of course, you can always find more resume writing advice by checking out our various resume section articles. 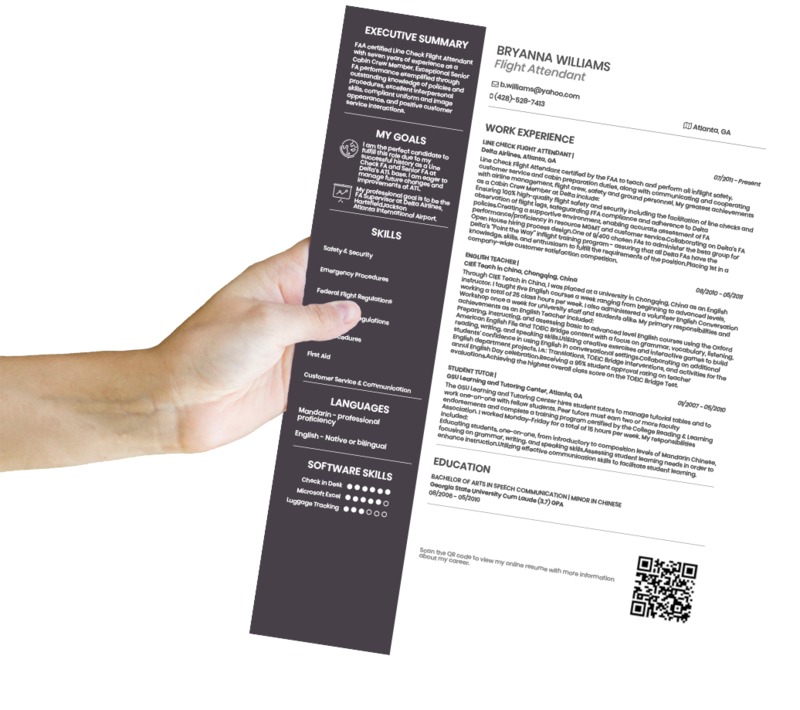 Any successful resume incorporates a concise overview of a candidate’s career specific achievements, experience, and skills in an executive summary section. As a student or recent graduate, it is understood that you will not have as many years of experience working in the field that you are applying to. 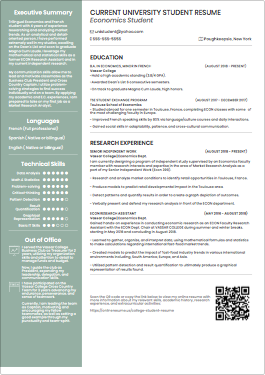 So, you should utilize the professional summary as a way to summarize your industry specific qualifications gained throughout your academic years. List any special recognitions that you have been awarded, as well as your applicable experience - whether gained through internships, field work, or volunteer activities. This is the first section on your resume, so it should be written in a way that draws the reader in. The executive summary serves as a method to invite the recruiter to continue reading the rest of your resume. Thus, you should show off your special recognitions and transferable skills that directly align with the job post and career field by putting them in bold. If you have limited work experience in your desired career industry, put more emphasis on your education section by placing it at the top of your resume. We suggest that you position your academic background before your work experience section on your resume, but after your executive summary. Make sure to highlight the aspects of your education that directly align with the job at hand. List your degree, institution, and year of graduation. Clarify that you are a current student by including the year you began studying and the word present. i.e. : (2015-Present). Include your GPA as long as it is 3.5 or higher, as well as any special recognitions such as Latin honors or department awards. If you have ample space on your resume, you may even want to consider creating a separate section for your awards and honors. Don’t forget to incorporate what you studied, a.k.a your major/minor(s). Recruiters are typically more interested in what your speciality is, rather than where you gained said knowledge and expertise. For this reason, it is often more beneficial to highlight your field of study than the college or university that you attended. Of course, if you went to an especially well-known and esteemed educational institution it is probably worth accentuating, along with your field of study. You can emphasize any part of your academic background by positioning it at the top of your education section, bolding the text, or writing it in uppercase letters. It is especially important to draw attention to your area of study in the case that your major/minor(s) directly correlate with the job position that you are applying to. In the case that you didn’t earn a degree in a field of study that aligns with the job industry that you are applying to, you may consider incorporating applicable courses that do in fact relate to the job at hand. You can list them in your education section, or create a separate section titled “relevant courses” or “relevant [name of career field] experience,” i.e. : (relevant marketing experience). Always keep in mind, that your goal is to display your experience and skills that make you an ideal candidate for the specific job role that you are submitting an application for. You can view academic history formats and examples in our Education Section article. As a current student or recent graduate, you may not have an extensive amount of paid full-time work experience in your desired career field. In this case, it is important to incorporate any internships or practicum experience that relate to your specific job industry within your work experience section. In general, you should include all of your relevant experience, whether paid or unpaid including fellowships and voluntary positions, to provide evidence of knowledge of the workplace and career industry. In terms of format, as a student, it is typically recommended to put more emphasis on your education section by positioning it above your work experience section. This also applies to new grads, especially if you do not have a lot of exposure in your career area. In any case, remember to always include your job title, name of company, a brief company description, start and end dates, as well as your main responsibilities and accomplishments. Use job-related action verbs to enhance your descriptions, and use numbers when possible in order to measure your achievements. We recommend that you use bullet points for your responsibilities and achievements, so as to make them stand out as well as enhance readability. Another viable option, in the case that you don’t have a lot of work experience within your career field, is to change the title of the work experience section to “[name of career field] experience.” This way, you can list relevant work experience, as well as courses, internships, volunteerism, and extracurricular activities, that directly relate to the industry that you are applying to. This will effectively draw hiring managers eye to this section and will compartmentalize your relevant industry experience, not only your previously held job positions -- which at this point may range from campus employment to working at a restaurant during summer breaks. Instead of listing a broad range of part-time work experiences, common among current students and recent graduates, it’s better to tailor your resume to your desired job field. In order to show the hiring manager why you are qualified for the job position at hand, it is vital to incorporate your industry-specific knowledge and abilities throughout your resume. You should include both your soft skills and hard skills. Although, it is important to recognize that employers tend to look for relevant technical expertise in an ideal candidate. Utilize your executive summary in order to highlight some of your most pertinent technical and social skills. Explain how you utilized these skills throughout your related career field training, by including them in your work experience descriptions. As a current student or recently graduated professional, you will most likely have more space on your resume, thus it is extremely advisable to create a separate section exclusively dedicated to your technical skills. Remember to read the job listing description and take note of the required skills needed for the job role. If you possess any of these necessary abilities and knowledge, make sure to include them in your skills section on your resume. You can quantify your level of mastery for your technical capabilities by incorporating a scale (i.e: 4/5 stars, 5/5 points, 90/100 %), or by recording the number of years you have been exercising said skill. Even if you do not have any job-related experience within the industry that you are applying to, you may still have some transferable skills. Thus, you should make your applicable skills a focal point; no matter whether they were gained throughout your academic background, internships, training, practicum, and/or extracurricular experiences. Make your resume stand out by taking every opportunity to emphasize your job-specific skills. Just keep in mind that you will have to justify any skills that you list on your resume in the interview step of the hiring process, by giving examples or even demonstrating these abilities in-person. You can find more information about hard skills vs. soft skills, example skills and levels of mastery, and how to best incorporate these abilities and knowledge throughout your application in our Resume Skills article. If you received any significant awards or honors during your education, internships, volunteer experiences, and/or extracurricular activities, it is crucial that you play them up on your resume. This is not the moment to be shy about your unique accomplishments. Show off what makes you original. By highlighting your honors and awards, you will successfully set yourself apart from the other candidates. As a college student or recent graduate, it is especially recommended that you emphasize special recognitions such as scholarships, academic awards, and honor societies. You can list your special awards earned during your academic experience under your education section on your resume. You may also consider highlighting any outstanding honors in your executive summary, especially those that directly relate to the job position that you are applying for. As a current student or recent graduate, you will most likely have more space on your resume than a professional with several years of work experience. Thus, if you have received more than one accolade, it may be beneficial to create a separate section specifically designated for your awards and honors. In this way, you will more successfully occupy any extra space you have on your resume. In addition, you will have more room to give a brief explanation of the award, rather than simply listing it with no context or frame of reference. You should always list the name of the award, the year earned, and the institution where it was awarded. Make sure to provide a concise description of the honor or award and how it is applicable to your desired career industry. Explain the scope and significance of the honor, but try not to include unnecessary details that are irrelevant to the job position at hand. Discover how to format your special recognitions with practical examples in our Awards and Honors article. By utilizing an interests section, current students and recent graduates can not only demonstrate relevant skills gained through extracurricular activities, but also show off any leadership roles or club/team participation that relates to the job at hand. We encourage students and graduates, to incorporate a section specifically dedicated to extracurricular activities in order to highlight interests that add value and uniqueness to your application. You can always incorporate any relevant volunteer experience within this section. Most importantly, make sure to describe the skills gained through your participation in said club, team, or organization, and how this has benefitted you in your personal and/or professional/academic life. Considering the fact that you will not have as much paid work experience as other candidates who have been in the workforce for several years, it is particularly valuable for students and grads to elaborate on volunteer work. This is especially true for those volunteer experiences that directly correlate with the job field or position that you are applying for. In this case, you can incorporate relevant voluntary work positions in your work experiences section. On the other hand, if your volunteer work is unrelated to you your desired job field, you can create a separate volunteer experience section. Just make sure to emphasize any transferable skills gained through your voluntary work. In either case, treat your volunteer experience descriptions like work experience by including your job position, name and brief description of the organization, as well as your main responsibilities and accomplishments. Consider adding any applicable projects, research, and/or coursework that are directly related to the job that you are applying to, either under your academic experience section or customized “[name of career field] experience” section. Make sure to give a brief description of the work carried out during this project, investigation, or course, especially in terms of how it applies to the job at hand. This will further demonstrate your relevant experience in your desired career field, despite your lack of employment history in this area. You can incorporate your job roles that do not exclusively pertain to the job industry that you are entering, however you should be sure to modify any work experience description to incorporate transferable skills that are important to the job position that you are applying for. Think about how you can present this experience in a way that correlates with your desired career field, as well as your potential employer’s and company’s needs. Articulate how you used job-specific knowledge and abilities to successfully fulfill the role. Demonstrate how the skills you gained through this experience can be applied to the job role at hand. As a college student and recent graduate, you should begin to quantify your accomplishments and responsibilities within your work experience and voluntary work descriptions as a way of demonstrating your worth as an employee. You can read more about how to create quantifiable examples here How to Write Better Work Experience….”. Don’t forget to play-up any leadership roles that you held. Show off your capacity to lead, as well as your dedication and commitment to specific projects, clubs, and organizations. Advertise your management skills by giving concrete examples of what was accomplished during your time leading. Make sure to add your language abilities to your resume, especially if you speak two or more languages at a high fluency level. You can include these communication skills within your skills section or create a separate section just for languages. Remember to include your level of mastery for each language, ranging from basic/elementary to native/bilingual proficiency. Finally, have someone review your resume before your final application submission. Reach out to your campus career office or even an alum in your career field. Ask them to look over your resume and make sure that you have as much industry specific information as possible. Encourage them to alert you to any grammar and spelling errors, as well as resume format issues. Just because you are getting started in your desired job industry, doesn’t mean that you do not have noteworthy achievements, knowledge, and skills to show off on your entry-level resume. Employers and hiring managers know that as a current student or recent graduate you will not have the same amount of work experience as a seasoned professional, and thus they do not expect to see a long list of previously held jobs in your career field. However, they do want to see how your academic history, club participation, and voluntary or paid work experience relate to the job at hand. Whether it’s a summer job, coursework, extracurricular activity, or volunteer work, the quality of your application will increase with each career-related experience that you include on your student/graduate resume. No matter whether you are a professional with an extensive work history, a student who is finishing their education, or a new college grad, the key to creating an exceptional application is to customize your resume according to the job role, career field, and company that you are actively applying to. 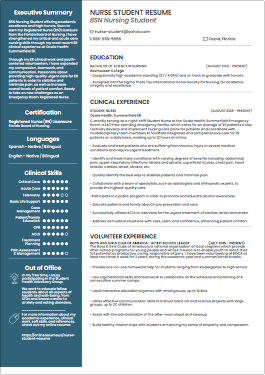 At onlineresume.us, students and graduates can access resume writing guides for each resume section, view job-specific resume samples, as well as create original online and PDF resumes for each of their applications.